Did David Cameron have to call a referendum? Did history put a gun to his head? And was Britain’s departure from the EU destined from the moment he called it? Was it a lost cause, or did the Prime Minister lose it? Sky News senior political correspondent Jason Farrell teams up with political blogger and economics and politics teacher Paul Goldsmith to provide the definitive story of one of the biggest shocks in British political history. Probing into the social fabric of the UK, the psyche of the electorate, and seventy years of European history, Farrell and Goldsmith identify eighteen key reasons why the UK made its choice, from Britain’s absence at the birth of the European project to the inflammatory rhetoric of one Nigel Farage, and everything in between. 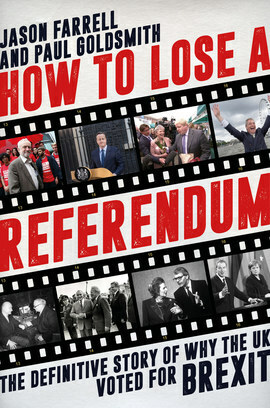 How to Lose a Referendum is the product of extensive and refreshingly frank interviews with the key players from both campaigns coupled with a wide-ranging exploration of the historical context around Britain’s departure. Why was a project designed for common peace and prosperity ultimately so hard to defend? Whether you’re a Leaver or a Remainer, a newcomer to the debate or a battle-hardened politico, this nuanced and thoughtful analysis will change the way you look at Britain’s vote for Brexit. "Farrell and Goldsmith tell the story with exceptional clarity, insight and thoroughness, and, even if you know this topic well, you’ll learn something new. It is the best single-volume account of all the factors that contributed to Brexit."